A 10-year-old elephant sustained multiple injuries when it hit by a State Express Transport Corporation bus here near Shoolagiri on Monday. The accident took place on Krishnagiri-Hosur national highway in the early hours. The elephant, a makhna (tuskless), had crossed the highway after dismantling the median barricade. The pachyderm walked out of the Chettipalli reserve forest and was crossing over to the Sanamavu reserve forest when it was hit by the bus. The animal suffered abrasions on the body and legs and could not move one of its hind legs. The animal lay there for over three hours and the Forest department administered first aid and made arrangements to shift it. The results of X-ray were awaited. Water was splashed on the elephant to cool it down and damp gunny sacks were placed on its body. 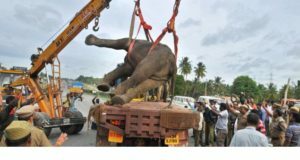 The elephant was lifted to an open truck with a crane. 1.140,160 every year: Indian roads claim the maximum number of lives in 2014.It is said that about 1.2 million people die due to road accidents all around the world in a year, and about one in 14 of those involved an animal. 3.The elephants are extremely important, respected and revered in Indian culture.Indian elephants were the most intelligent and trainable animal. What are the important animals in your country? Why are they important? 4.How can road accidents be eliminated in your country?